Election offices across Florida will have to hand count at a bare minimum almost 54,000 ballots in the U.S. Senate race. A survey of 64 of Florida’s 67 counties by The Associated Press put the number of overvotes and undervotes Thursday evening at 53,769 ballots in the U.S. Senate race between incumbent Democratic Sen. Bill Nelson and GOP Gov. Rick Scott. The only counties that hadn’t reported those counts were three of the state’s largest: Broward, Lee and Palm Beach counties. In an overvote, a voter picks more than one choice for the same race. With an undervote, the voter doesn’t pick a choice in a race. The deadline for finishing the hand count is Sunday. Florida’s secretary of state has ordered a manual recount in the state’s hotly contested U.S. Senate race. Department of State spokeswoman Sarah Revell said in a news release Thursday evening that unofficial returns from a machine recount had triggered a second recount in the Senate race and the state agriculture commissioner’s race. Unofficial Florida election results show that the governor’s race seems to be settled after a machine recount but the U.S. Senate race is likely headed to a hand recount. Unofficial results posted on the Florida secretary of state’s website show that Republican Ron DeSantis is virtually assured of winning the nationally watched governor’s race over Democrat Andrew Gillum. Florida finished a machine recount Thursday that showed Gillum without enough votes to force a manual recount. The margin between U.S. Sen. Bill Nelson and Gov. 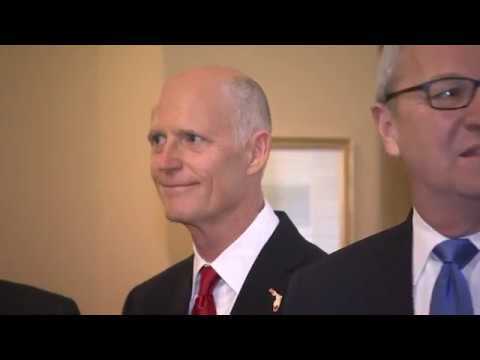 Rick Scott is still thin enough to trigger a second review. State law requires a hand recount of races with margins of 0.25 percentage points or less. The Associated Press will not declare winners in the races for Florida governor and Senate until state officials certify the results next week. In the race for governor, Republican Ron DeSantis leads Democrat Andrew Gillum by 33,684 votes of more than 8.2 million votes counted. In the race for Senate, Republican Rick Scott leads Democratic incumbent Bill Nelson by 12,562 votes. Both races were the subject of machine ballot recounts due Thursday afternoon, and results were pending. Gillum initially conceded the governor’s race on election night but later said he wanted to see every vote counted once a state-mandated recount was initiated. Florida counties have until Sunday to report final vote tallies, and state officials would certify those results next Tuesday. Florida counties have reached the deadline for submitting the results of their election recounts. A federal judge earlier rejected a request to give counties more time beyond the 3 p.m. Thursday deadline to finish their recounts. Palm Beach County’s election supervisor had warned that the county would not be able to complete the recount on time. The state’s 67 counties were required to do machine recounts of more than 8 million ballots cast in the contentious midterms. The U.S. Senate and governor’s races were among the three within the vote margin to trigger a machine recount. Several lawsuits have been filed by Democrats and Republicans in the wake of the close election. A federal judge is refusing to suspend looming election recount deadlines in the battleground state of Florida. U.S. District Judge Mark Walker on Thursday rejected a request by U.S. Sen. Bill Nelson and Democrats to give counties more time to finish recounts. All 67 counties are required to submit the results of a machine recount by 3 p.m.
Palm Beach County’s election supervisor has already warned that the county will not be able to finish on time. In his ruling, Walker said he was concerned that some counties may not complete their work by the deadline. But he said there is a lack of information on when Palm Beach County would wrap up its work. Bucher says she believes her office did everything it could despite not completing the U.S. Senate race recount. She blames aging equipment for the delays in meeting Thursday’s deadline for machine recount results. A federal judge is sharply criticizing Florida legislators and elections officials in Palm Beach County for the state’s chronic recount issues. During a hearing on whether to extend the 3 p.m. Thursday deadline in the state’s recount for a U.S. Senate seat the governor’s race, U.S. District Judge Mark Walker noted that Florida has a history of “razor thin” elections, yet Palm Beach County delayed purchasing enough voting machines to handle a recount. The judge also said that the recount procedure in Florida law is written in a way that doesn’t allow for possible problems. He suggested that runs against past federal court rulings, including the Bush v. Gore ruling that decided the 2000 presidential recount. A federal judge is giving thousands of Florida voters until this weekend to fix their ballots if they haven’t been counted because of mismatched signatures. Walker did not go along with a request from Democrats to count all ballots with mismatched signatures. Instead he ordered that local election officials give voters until 5 p.m. Saturday to correct the problem so that their ballots can be counted. State officials testified in court that nearly 4,000 ballots have already been rejected because local canvassing boards decided the signature that was mailed-in doesn’t match the signature on file. Florida’s bumpy recount election reaches a pivotal point Thursday as most counties across the state complete reviews that could determine the next senator and governor in one of America’s top political battlegrounds. Barring a dramatic last minute court-mandated extension, Florida counties face a 3 p.m. deadline to wrap up their machine recounts. Some counties have warned that they may not be able to make the deadline. The machine recount may essentially bring a conclusion to the governor’s race. Republican Ron DeSantis leads Democrat Andrew Gillum by 0.41 percentage points in unofficial results, but the election won’t be certified until Tuesday. Unofficial results in the U.S. Senate race have Republican Gov. Rick Scott ahead of Nelson by 0.14 percentage points, which will almost certainly send it to another recount that will last through the weekend.